Finger Springs - T.R. 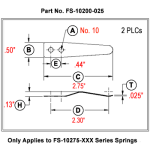 Goldsmith & Son, Inc.
Our tooling finger springs are made from the finest spring steel. They are carefully fashioned and heat-treated. All sizes are standardized and In Stock, reading to ship for your application. Part No. "A" "B" "C" "D" "E" "H" "T"
FS-6100-010* 1 NO. 6 .32" 1.00" .75" N/A .06" .010"
FS-6100-015* 1 NO. 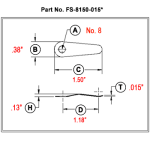 6 .32" 1.00" .75" N/A .06" .015"
FS-8150-015* 1 NO. 8 .38" 1.50" 1.18" N/A .13" .015"
FS-8150-020* 1 NO. 8 .38" 1.50" 1.18" N/A .13" .020"
FS-10200-020 1 NO. 10 .44" 2.00" 1.65" N/A .16" .020"
FS-10200-025 1 NO. 10 .44" 2.00" 1.65" N/A .16" .025"
FS-10275-025 2 NO. 10 .50" 2.75" 2.30" .44" .13" .025"
FS-10275-032 2 NO. 10 .50" 2.75" 2.30" .44" .13" .032"
Finger Springs with an asterisk* following the part number are self locking using 3 locking ears around screw.